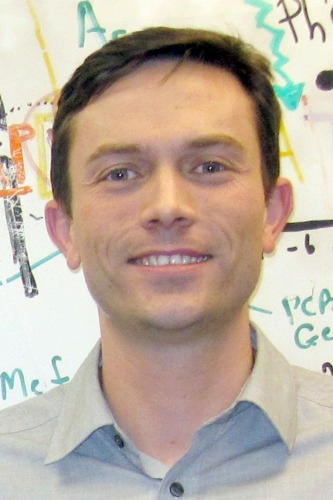 Peter Lewis, an assistant professor of biomolecular chemistry at the University of Wisconsin–Madison, has been named a Pew scholar in the biomedical sciences by The Pew Charitable Trusts. Lewis, a faculty member at the university’s Wisconsin Institute for Discovery, is one of 22 early-career biomedical scientists to be honored as a Pew scholar, an award meant to identify researchers with outstanding promise in science relevant to human health and with particularly creative and innovative approaches to their work. Pew scholars are chosen by an advisory committee of notable scientists, and are invited to an annual meeting of their peers to discuss their research. They also receive four years of funding to be spent as they wish in their labs. Lewis, who joined the UW–Madison faculty in 2013, studies the way changes in the structure of chromosomes affect the development of animals. Lewis hopes to understand how histones are modified and how those changes could play a role in cancer treatment. Chromosomes are large strands of DNA wrapped tightly — like thread on a spool — around proteins called histones. But histones are more than just a spool. Their structure and chemical composition can mute or amplify the way individual genes (or groups of them) are expressed. Each time a cell replicates, the strands of DNA are unwound and histones are removed and replaced. Because histones often change during this process — and some histone changes are known to play a role in tumor development — Lewis hopes to understand how histones are modified and how those changes could play a role in cancer treatment. Lewis earned his doctorate in molecular and cell biology from the University of California, Berkeley, and conducted postdoctoral studies at Rockefeller University. His UW–Madison lab is part of the epigenetics research theme at the Wisconsin Institute for Discovery.